Luxury car firm Aston Martin is heading back into British hands after being sold by Ford in a £479m ($924m) deal. Banbury-based Dave Richards, boss of motorsport firm Prodrive, is heading the UK-led consortium buying Aston. Kuwaiti investors are also involved. Ford is selling off the marque - made famous by James Bond - for $439m as it tackles its own financial woes, but the group is holding onto a £40m stake. Ford bought a 75% stake in Aston Martin in 1987, and bought the rest later. 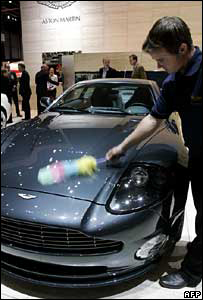 Aston Martin will remain at its purpose-built factory in Gaydon in Warwickshire, which employs 1,800 people. Mr Richards - who is making his investment in a personal capacity - is a former accountant who was a co-driver in professional car rallies and has been described as the "Richard Branson of motorsport". His company Prodrive already runs the Aston Martin racing team in the sports car series around the world, as well as the Subaru world rally team. "This is an incredible opportunity - Aston Martin is one of the world's most iconic brands," he said. "We are confident we now have all the right ingredients to take Aston Martin to even greater heights." Also in the consortium is John Sinders, a banker in finance and shipping who spends his time between Texas and Dubai. "The dream for me was to own an Aston Martin, never to own part of the company. It's a dream come true," Mr Sinders told the BBC. Two Kuwaiti companies - Investment Dar and Adeem Investment - complete the group. 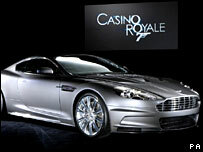 Aston Martin chief executive Ulrich Bez said the partnership was "a tremendously exciting opportunity". "It is a new beginning which will give the company the opportunity to attain an even higher level of excellence," he said. "This next stage in the company's history promises to be the most exciting yet." Mr Richards' consortium also said that earlier speculation that Prodrive may brand its cars Aston Martin when it enters Formula One racing next year was completely unfounded. Analysts have said that the greatest challenge for the new owners will be whether they have deep enough pockets to fund the car models needed to keep the business competitive against its top-end rivals. Six months ago Ford put the marque back up for sale in response to its financial problems. Ford lost more than $12bn in 2006, and has had to take out a $23bn mortgage to cover its restructuring. It said the sale was "good news" for both Ford and Aston Martin. How much should a buyer pay for the two marques? Who gains most from Jaguar sale?